I use my food processor for this recipe as it saves so much time. If you don’t have a food processor you can finely chop the broccoli with a knife, whisk in the wet ingredients then fold in the flour. 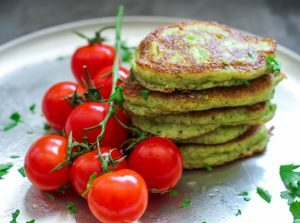 These fritters keep well and can be re-heated in the microwave or oven. Using a food processor blitz the broccoli until fine. Then add the gorgonzola, egg, nutmeg, salt and pepper. Once you have reached a smooth consistency fold in the flour and mix well, taking care not to over-mix. Take a large frying pan, place on a medium/high heat and add a couple of tablespoons of olive oil. When the oil is hot add tablespoons of the mixture around the edge of the pan. The mix will be quite loose (wet) so you will need something with a large surface area to slide underneath the fritters when it comes to flipping them over. Cook for about two minutes on each side then transfer to a baking tray. Pre-heat your oven to 180C then finish the fritters in the oven for about seven mintes. The fritters may still be wet in the middle but that is absolutely fine. I prefer them this way. If you want to fully cook your fritters you can them to cook in the oven for a further three minutes or so.